A Selfie and One Garish Jacket: How the Red Sox Won the White House - trendistic.com: ever tried. ever failed. no matter. try again. fail again. fail better. The 2013 World Series champion Boston Red Sox visited the White House on Tuesday for the president’s customary meeting with teams that win American sports titlesChris Bosh photobombs aside, these are usually pretty buttoned-down affairs — but the Sox completed their visit in style. So just how did these Red Sox win the White House? 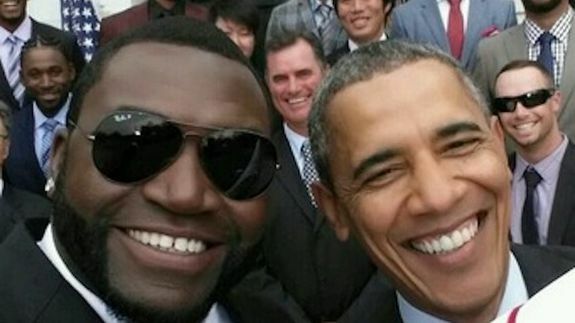 A presidential selfie from none other than David Ortiz and one of the most, um — we’ll just go with “patriotic” — suit-jackets we’ve ever seen.